If you’re familiar with the works of Mel Brooks, and particularly the cult-classic Blazing Saddles, then it’s likely you’d remember the phrase, “Do it for Randolph Scott.” In the 1974 classic comedy, the sheriff has to rally his town residents to take a stand and fight together against the villain. When the townspeople want to give up, the sheriff inspires them by yelling, “You’d do it for Randolph Scott!”. Though the characters in the movie are fictional, Randolph Scott is not. He was a famous actor from our founding city of Charlotte who in 1987 died from lung cancer. He is the great-uncle of Scott Yamanashi, a current member of the Team Crank Mafia, and since he could have benefitted from the programs that 24 Foundation provides, they really are doing it for Randolph Scott this year. 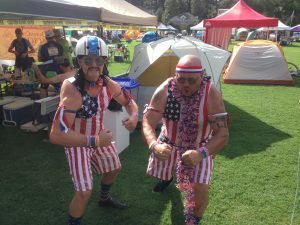 We spoke to two of the members of Crank Mafia to get more of the story behind their inspiration and to hear about their fun ways to fundraise. Team co-captains Pel Deal and Matt Magnasco have been involved with Crank Mafia and 24 Foundation for years, Pel even rode in the very first 24 Hours of Booty that was open to the public, and he’s got the shirt to prove it! “I heard about the event directly from [the founder] Spencer Leuders on the Booty Loop. Having both relatives and friends with cancer, his story resonated with me. 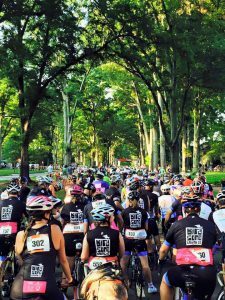 I decided I would like to devote some time to help fight cancer and formed a small team.” Pel continued to participate for years, accomplishing great success in both fundraising and mileage during the event. Family matters eventually took him away for some time, and he no longer had the time to do the long rides and training that he had done in years past, until a friend encouraged him to get out and ride again. “I rode 160 miles and raised over $1600. It felt good to be back.” Refueled on the electricity that comes from 24 Hours of Booty events, he was ready to sign up again the following year. 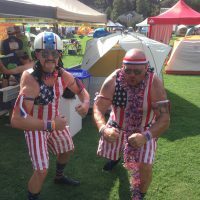 Pel described Crank Mafia, as it is today, as a “loosely organized group of people from beginners, social only riders, mountain bikers, and commuters, to the fully kitted road riders,” but regardless of the fun they’re having, they have not forgotten the mission driving the event. All of the commonly-costumed participants have their own reasons for participating, and Pel’s is his family. “My grandfather died from cancer, my uncle died from cancer, my father had cancer. I have too many friends that have suffered or are suffering from cancer. I am not wealthy and don’t have the resources to fund a hospital, but I have seen the direct results of what 24 Foundation does and find that it is a way to help using the resources available to me.” Matt’s mission is similar, finding a way to make a difference for others. 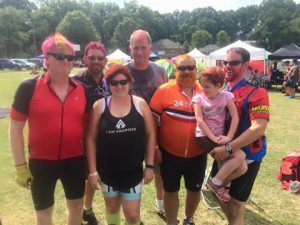 “Each year when I fill in my ‘I’m riding in honor of’ and ‘I’m riding in memory of’ bibs, the list gets longer and longer.” We hope that this year, Pel and Matt can feel the difference they are making when they go to ring that Achievement Bell in Bootyville.